Occasional symptoms of elevated ICP: Some children have complaints suggestive of elevated ICP. Younger children with unrepaired synostosis may have regression in milestones, inability to meet milestones, sleeping difficulties, and behavioral problems. School-age children may have a decrease in academic accomplishment and/or a change in behavior. If the patients are of verbal age, complaints may include headaches. Nausea and vomiting can occur at any age but are unlikely in older patients. Shape present at birth: Characteristic head shapes of craniosynostosis are usually observed at birth. However, some may be subtle. All progress over time. Some cases of metopic synostosis are mild and progress minimally. Worsens with time: Sagittal craniosynostosis is apparent at birth and usually worsens. The frontal and posterior bossing will worsen, thereby increasing the AP diameter and worsening the narrow appearance of the head. The ridge becomes more apparent. Differentiate from doliocephaly: Sagittal craniosynostosis must be differentiated from doliocephaly, which is a long narrow head shape from an in-utero or postnatal position. 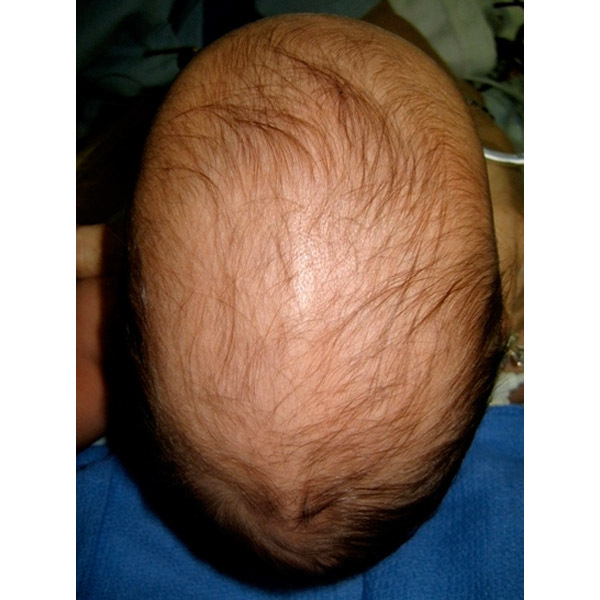 This head shape is common in a NICU infant. If this child is seen early enough, one may be able to gently palpate movement of the parietal bone plates. Such movement is not felt in sagittal craniosynostosis. Macrocephaly: The present and past head circumferences should be recorded. Stable macrocephaly is common in children with scaphocephaly (2). Confirm it is not positional deformity: Has child always looked like this? Was he/she born like this? Is it better or worse? Did the child have torticollis? Did the child sleep on a certain side of the head? Coronal synostosis must be differentiated from anterior positional plagiocephaly (truly rare). The ear will be located more posteriorly in the latter. Deformity worsens with time: Worsening orbital elevation and flattening of the forehead occur. Differentiate from normal closure of suture: Normal closure of the metopic suture must be differentiated from craniosynostosis. The metopic suture will close normally between the ages of 3 and 9 months. The normal sequence of closure begins at the nasion and extends to the anterior fontanelle. It may cause a ridge. However, there is no trigonocephaly, the orbits are usually normal, and the anterior fontanelle remains open until the termination of closure (49). Differentiate from positional plagiocephaly: The flatness to the back of the head is not associated with a forward projection of the ipsilateral ear or forehead. The mastoid prominence becomes quite impressive, and the ipsilateral ear is further posterior in comparison to the contralateral ear. Bossing and ridging develop over first 6 months: Mild cases may be difficult to detect at birth. The head may just appear to be “long and narrow.” However, over the first 6 months, the frontal and posterior bossing and ridge will become apparent. Progressive worsening: Even mild cases are apparent at birth because of the asymmetry in the orbits. Over time the deformity worsens. May not be evident at birth: Mild cases may be difficult to detect at birth and may be difficult to differentiate from normal sutural closures. Some worsen, some do not: If the closure is moderate to severe, metopic synostosis will worsen with head growth. If it is mild, there may be no trigonocephaly or regression of the orbits, and the patient may not need surgery. At early point mistaken for positional plagiocephaly: Mild cases may be difficult to detect at birth and initially will be mistaken for in-utero plagiocephaly. By 6 months mastoid prominent and contralateral bossing: Over the next 6 months, the flattening will worsen, and the mastoid prominence and the compensatory parietal bossing on the contralateral side will become apparent. Bony ridge: A bony ridge extends along the midline from the anterior fontanelle to the posterior fontanelle, both of which will be closed. Compensatory growth is in the anterior and posterior direction. Variants in the closure of the sagittal suture include the anterior, middle, or posterior portion only. Scaphocephalic head shape: The characteristic head shape in children with sagittal synostosis is long and narrow (scaphocephalic). Status of fontanelle: A closed fontanelle is not an emergent indication for surgical release as long as the head is growing well and the child is developmentally normal. Funduscopic examination: 15% of children with single suture craniosynostosis have increased ICP. 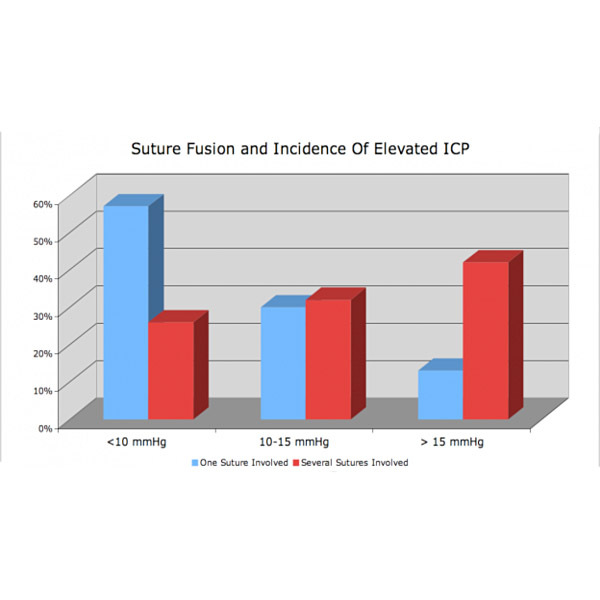 Increased ICP is more common in multiple closures and syndromic cases. Head shape: There is a bony ridge along the fused suture. The lateral forehead is flattened, with the ipsilateral ear forward. There is a foreshortened orbit with recession of the orbital rim. Compensatory growth is apparent in the forehead on the opposite side. Status of fontanelle: A closed fontanelle is not an emergent indication for surgical release as long as the head is growing well and the child is developmentally normal. The fontanelle is usually closed.